I will always remember my first day at work, after leaving school at fourteen in 1931. On Manor Farm, where my father, grandfather and uncle were working there were fourteen men and lads and as many horses, one for each of us. 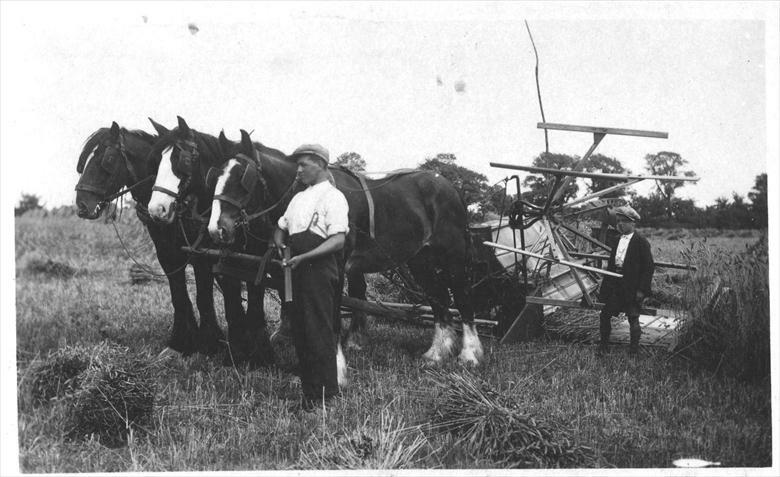 My father had three horses pulling a drill sowing spring wheat that day, while Joe Prime walked behind the drill to make sure it was working, and I came behind with two horses pulling a set of harrows. I was up and down from eight in the morning until two in the afternoon, with a half hour break at half past ten. I had a new pair of heavy nailed boots on and by two o’clock I had big blisters on my heels. I didn’t want to go to work next day, but my father said “Stick it lad,” so back I went and by lunch time I had my boots off and pieces of sacking wrapped round my feet because the blisters had broken. The next day the Guv’nor let me help with the chickens, because I was limping, and another lad took my place at the drilling. Come Friday I had my first week’s pay, nine shillings, which is now forty five pence. I was proud of that week’s pay, which Mr Peters and my father increased to ten shillings and sixpence because I had stuck it out despite my blistered heels. This page was added by Pat Grigor on 07/10/2012.